A stroboscope is a flashing light with a variable flash rate. As a calibrated laboratory instrument, it serves two major purposes: by optically "freezing" the motion of a rotating or reciprocating machine, it can determine the operating frequency, and also allow critical examination of these machines while in motion (Figure 1). For us occasional handymen, they are useful in examining power tools like drills, saws, and other tools in the shop, plus around the house for fans, kitchen mixers, blenders, and so forth. They can even be used to freeze the motion of a loudspeaker at a constant tone to look for causes of distortion. FIGURE 1. The StroboDuino "stopping" a boxer fan with three color dots applied. Traditional stroboscopes have been expensive enough so that only a few hobbyists or other non-professionals owned them. They used photoflash tubes that — while truly bright — limited their flash rate and required high voltage power supplies. Their heavy power supplies and regular need for AC power compromised their portability. With the advent of inexpensive digital control circuitry and ever-brighter LEDs, some of these problems have been corrected. It’s now possible to buy a lab-grade LED stroboscope (at a fraction of their previous cost) that is portable and even battery powered. The drawback is that LEDs just aren’t usually as bright as photoflash tubes. 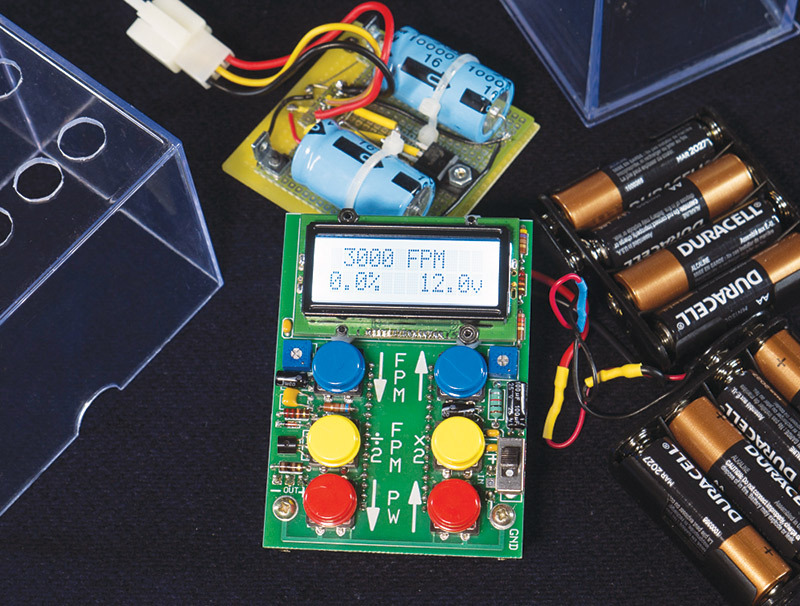 The StroboDuino is a non-professional grade stroboscope that can be built for around $50. It uses some of the latest very bright LEDs that rival photoflash tubes. The low parts count as seen in the schematic (Figure 2) is due to the high level of integration of the Arduino and an integrated LCD module. The Arduino sketch (code) is simple and easy to understand, making this project an ideal first Arduino project. Another benefit of using the Arduino is that it’s crystal controlled, making the StroboDuino accurate to within 0.1%. Once built, it never needs periodic calibrations or other adjustments. There are a lot of ways to skin this cat. The StroboDuino as described here uses eight AA cells for its 12V power. While rechargeable batteries are a better choice for daily use, and a 12 VDC 2A wall wart is an even better choice if the StroboDuino doesn’t need to work away from AC power, the AA batteries suit better for occasional use. You can use any of these options. All stroboscopes suffer from sub-harmonic uncertainty. 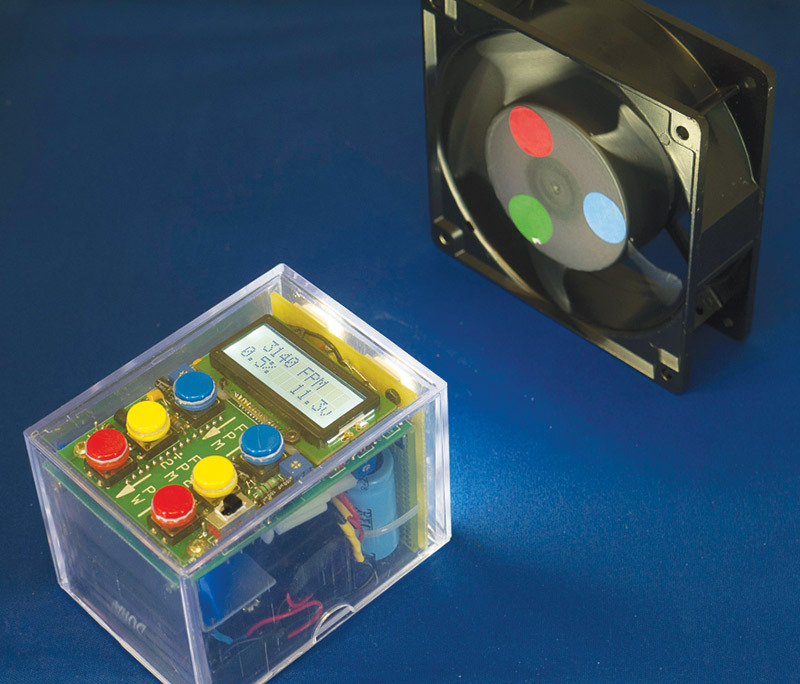 While it’s easy to see that a 12,000 RPM fan will be “frozen” by a flash at 12,000 FPM (flashes per minute), it may not be obvious that it also can be frozen by flashes at 6,000 FPM, and also at any other integer sub-harmonic such as 4,000 FPM, 3,000 FPM, 2,400 FPM, etc. The flashes will occur at the same rotational position, but every second, third, fourth, or fifth rotation. The eye may or may not be able to see any difference. The StroboDuino is no different in its behavior, except that its modern Arduino based hardware allows for the easy implementation of two buttons — the “times 2” and “divide by 2” — that were very difficult to include on old analog stroboscopes. They allow the user to check the exact second and half harmonic instantly. So, if a certain flash rate freezes a machine and 2x that rate causes two superimposed images, you probably have found the correct rotational rate. Spending a little time using these buttons will be clearer than this explanation. The harmonic behavior is illustrated in Figures 3A, 3B, and 3C. FIGURE 3A. The Arduino "stops" the boxer fan at 3,090 FPM. FIGURE 3B. At the second harmonic (6,180 FPM), the fan again appears to stop, but the doubling of the color dots gives away that it's the second harmonic. FIGURE 3C. The third harmonic and the color dots overlay each other, adding to gray. 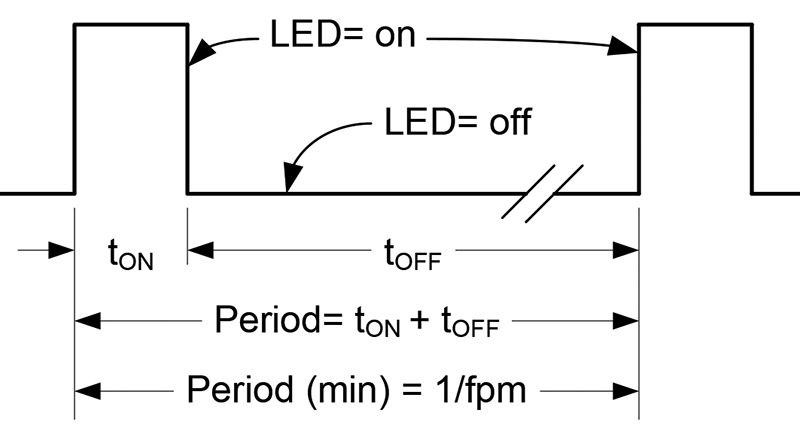 For this section, refer back to the schematic (Figure 2), Parts List, major components (Figure 4), and LED board (Figure 5). FIGURE 4. Component parts of the StroboDuino as assembled in a card file box. The schematic is divided into two sections to correspond to the two boards made to fit the enclosure I selected for a prototype (see photos). The larger section is the logic board and the smaller is the LED board. In my prototype, the selected enclosure is a clear heavy plastic box designed to hold 150 baseball cards. Found on eBay for about $2, it fits the parts neatly when the eight AA batteries are used for the power supply. Plus, being transparent, it offers the builder a view of the inner guts while making things fit together. The two boards and the batteries are (optionally) interconnected with three-pin Molex connectors that I found at MPJA.com. While the selected enclosure was handy during development, the builder should consider other enclosures — especially attractive are cannibalizing a large flashlight’s enclosure — either a pistol-grip or ‘lantern’ type. If you choose to use a smaller battery or an external wall wart, the reduced volume would allow something smaller, like a cylindrical flashlight. The choice is yours. The prototype in the photos used a printed wiring board (PWB) for the logic board, and a back-to-back pair of perf boards for the LED board. Again, you can choose this configuration or any other you’re comfortable with. The layout for the PWB was made with ExpressPCB software, and is available in the downloads. The logic board is pretty straightforward. The abundance of power supply bypass capacitors and the 1 mH choke (L1) are there to swallow as much of the LED switching transients as possible and isolate them from the Arduino. The Arduino Nano was selected because of its small size. It’s compatible with the more common Uno, but much smaller. I placed the Arduino on the bottom of the logic board PWB in order to free up real estate on the top of the board for button legends. The Arduino’s pin connections to the pushbuttons and the LCD display are not in numerical order for the convenience of the PWB layout. Since the Arduino provides complete flexibility in assigning pins, swapping pins in the sketch is far easier than moving PWB lands. R5 provides adjustment of U2’s display contrast, while R2-R3-R4 drop the battery voltage to less than 5V so that the Arduino’s analog-to-digital converter (ADC) can sample the battery voltage. The LCD display chosen is a 12-character x two-line display, using an industry-standard Hitachi CD44780 compatible controller. That makes it compatible with the LCD library in the Arduino IDE (integrated development environment) and a piece of cake to use. The unusual 12x2 format was chosen simply because the 16x2 was too large to fit the selected enclosure. This 12x2 LCD uses aggravatingly small connectors on .05” centers, rather than the 0.1” centers more common on the other displays. 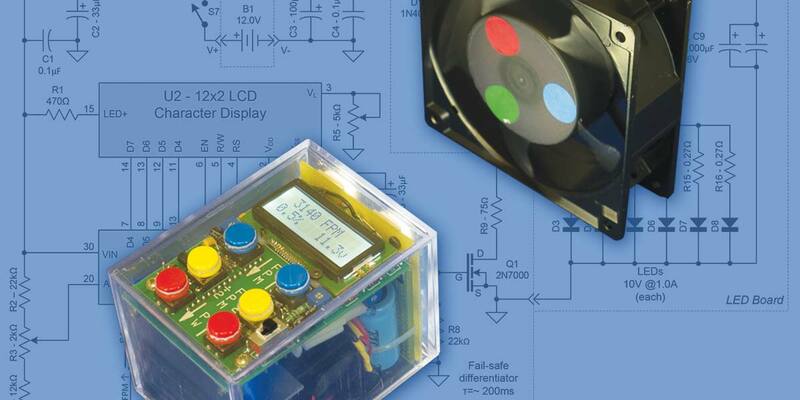 If you choose to use a larger enclosure, the 16x2 display will work fine and will be significantly easier to solder. Adjusting the sketch for the larger display is a snap. R1 supplies current for the LED backlight in the display. Varying its resistance (220Ω-4.7kΩ) will change the backlight brightness; 470Ω provides a comfortable brightness in my brightly-lit lab. The LED board is where the high current action is. Its heart is the big storage capacitor (C8+C9), Q2, and D3-D8. Each of these LEDs is rated at 1,000 lumens, 10 volts, and one amp. All six fire at once, drawing a total of 6A to produce a whopping 6,000 lumens. The large capacitance of C8+C9 provides energy storage to supply the LED’s 6A demand without subjecting the batteries to this high draw. The StroboDuino’s flash is limited to 10% duty cycle, meaning that the batteries will see a maximum average demand of about 600 mA. In practice, the flash duty cycle is usually kept at 0.5%, which drops the average battery demand to only about 30 mA — a very comfortable level for alkaline batteries. (Interpolating the graph on Duracell’s AA datasheet, the batteries should be able to source 30 mA constantly for about 20 hours before dropping to 11.2 volts.) Limiting the LED duty cycle also limits heat accumulation, allowing the LEDs to be used safely without heatsinks. R11-R16 represents equalizing resistors so that each LED will see the approximate same energy. Q2 (an NDP6020P) is a premium switching P-channel MOSFET optimized for extremely low ‘on’ resistance of only about 0.05Ω. While it’s important to keep this resistance low (it’s a pure loss), the loss is small compared to the equalizing resistors. Other (i.e., cheaper) P-channel MOSFETs can be substituted. Even bipolar NPN power transistors with slightly more voltage drop can be substituted. D1 acts as a check valve so that C8+C9 won’t reverse-power the logic board when it’s turned off, and also to drop the 12V battery voltage to something around 11.4 volts for C8+C9. When the drops of R11- R16 and Q2 are subtracted from the 11.4 volts, the LEDs are within their maximum voltage of 11.0 volts. The chosen LEDs are really bright, but expensive. You can substitute less expensive LEDs as long as the 11 volt supply voltage is taken into consideration in your design. 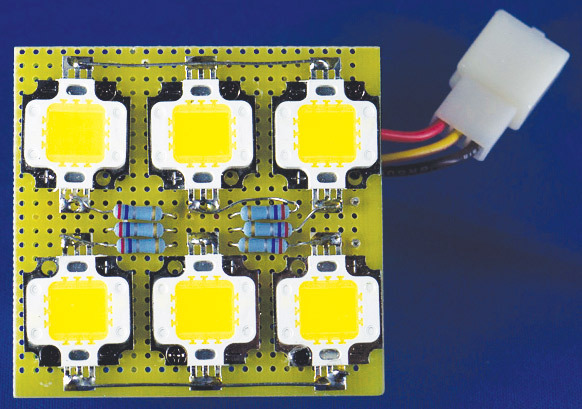 In most uses, the prescribed LEDs are overkill, and acceptable performance can be had from an array of smaller LEDs. This section will follow the flowchart (Chart 1) for the StroboDuino sketch which, in turn, refers to the StroboDuino sketch downloadable at the article link. Before we look at the details in the code shown in Listing 1, let’s do a high level overview. In operation, the operator selects flash rate with the FPM↑, FPM↓, FPM÷2, and FPMx2 buttons. The corresponding flash rate (in FPM) is always shown on the LCD display. The FPM↑ and FPM↓ buttons start off incrementing (or decrementing) by one; then, they actually accelerate as long as they are held down. The operator will need to become adept at ‘letting off’ to slow the rate of change. The FPM÷2 and FPMx2 buttons are debounced for one shot per button press. The bottom two buttons (with red caps in the prototype) are PW↑ and PW↓ for adjusting the pulse width percentage from 0 to 10% in 0.5% increments. 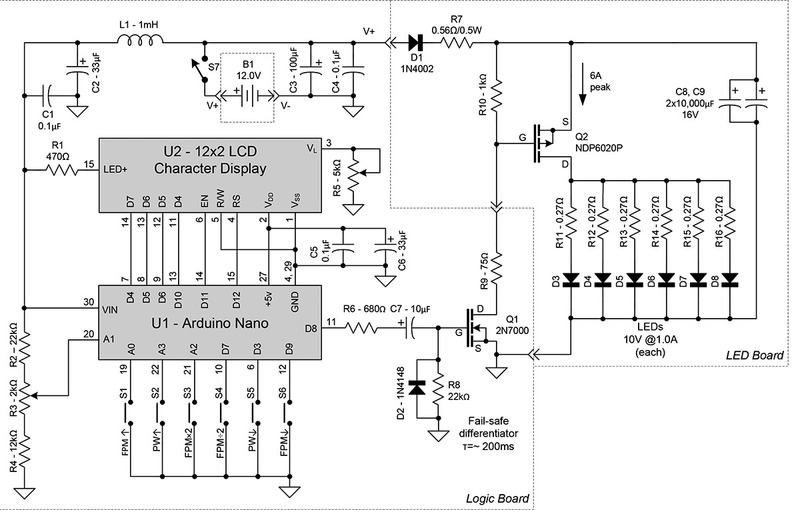 The StroboDuino uses the Arduino’s 16-bit Timer1 for its LED timing. The Timer1 loaders are derived from the inputted FPM variable and the pulse width (pw) variable; refer to Figure 6. The ‘period’ in this graphic is the timer loader variable calculated based on the FPM in the display. FIGURE 6. LED flash timing. That number is split according to the pw percentage, so that we have two loaders: one for the on time (rLoaderH), and one for the off time (rLoaderL). On each timer interrupt (each transition in Figure 6), the appropriate loader is written into the Timer1 register for the next phase. Simple as that. Looking at Table 1, we see how Timer1’s registers are used. TABLE 1. StroboDuino Timer1 interrupt operation. Since this is only a 16-bit timer, we have to also use the Timer1 prescaler in order to cover the StroboDuino’s extraordinary range of 15-399,000 FPM. This table also shows the calculated resolutions for each band, and the maximum round-off error contributed by the timer accuracy. While the error is acceptable for physical moving objects (less than 0.1%), the very high end of bands 4 and 5 have some interesting behavior. As the FPM nears its high limit in band 5, the display will show each FPM integer up to 399,000 FPM. The accuracy of the timer at this limit is only 166 FPM per timer tick. So, at the limit (399,000 FPM), you can change the displayed FPM by as much as 165 counts before the actual flash rate changes. As this is well within the 0.1% allowable error, it’s tolerable, if perhaps unexpected. It’s all due to the resolution of the Arduino’s Timer1. Using the Timer1 interrupt also causes another problem as the frequency increases. If the pulse width is short enough, as the flash rate is increased, at some point the pulse itself becomes too brief for the interrupt process to handle. The timer will time out while still in the interrupt routine and a new interrupt will occur. So, the process ends up chasing its tail. This happens at 20,338 FPM when the PW is 0.5% (pulse width is a scant 147 µs). To fix this, the Arduino will lengthen the pulse width as necessary (in normal 0.5% increments) to avoid interrupt misoperation. So, when transitioning from 20,338 FPM to 20,339 FPM, the StroboDuino will bump its PW from 0.5% to 1.0% automatically. To show that it’s done this, the LCD places an asterisk next to the changed pulse rate, so the operator can make note and manually change it when the FPM is reduced. The StroboDuino will continue to bump the pulse width as necessary to insure proper operation, right up to the maximum of 399,000 FPM where the pulse width must be at its maximum (10%) to avoid misoperation. These declarations include pin assignments, storage for the sketch’s variables, and two constants. As previously referenced, the pin assignments in the Arduino are simple and easily changed to accommodate your physical layout. Lines 6-8 are all the initialization the LCD needs; line 6 includes the LCD library; line 7 (a comment) shows the pin assignment format; and line 8 makes the actual pin assignments based on the format in line 7. Line 29 declares the Arduino crystal frequency in Hz. Since the StroboDuino timing is based on flashes per minute — not per second — the base timing unit in line 30 is crystal frequency in cycles per minute: rXtal. The ‘splash screen’ is what shows on the LCD before the operator starts operation by pressing one of the red buttons. The builder can display anything here, such as his/her name, the name of the device, etc. It has no effect on device operation. Lines 63-69 configure the port lines previously declared. Lines 73-84 set up Timer1 for interrupt operation and for a dummy starting value until the operator enters real parameters. This first function of the loop() section is to read the operator’s button pushes and set up the StroboDuino’s internal registers to reflect that input. The loop repeats every 200 ms (1/5 second) as directed in line 183. 111 - 114: If both PW↓ and PW↑ are pressed simultaneously, the StroboDuino selects PW = 0.0%. 115 - 122: If PW↑ is pressed, add 0.5% to the pulse width register. 123 - 130: If PW↓ is pressed, subtract 0.5% from the pulse width register. 131 - 142: If FPM↑ is pressed, the FPM register is incremented, and increments again every 1/5 second as long as the button is held down, as long as the maximum of 399,000 FPM isn’t exceeded. If after five counts (one second), the button is still pressed, it begins to increment by five on each 1/5 second tick, as long as the maximum of 399,000 FPM isn’t exceeded. After 10 counts (two seconds), it increments by 10 on each tick until 399,000. After 15 counts (three seconds), it increments by 100 as above. After 20 counts (four seconds), it increments by 200 as above. After 40 counts (eight seconds), it increments by 1,000 as above. After 60 counts (12 seconds), it increments by 10,000 as above. 143-154: The exact same behavior as FPM↑ above is duplicated for FPM↓, except the FPM register is decremented (in the same progression) down to a minimum FPM of 15. The acceleration behavior of FPM↑ and FPM↓ is very easy to change if you want to modify it. Just change the self-explanatory constants in lines 131-154. 155-164: If FPMx2 is pressed and there’s room beneath 399,000, double the FPM. This button will only operate once on each button push and release. This is controlled by skipx2. 165-174: If FPM÷2 is pressed and there’s room above 15 FPM, halve the FPM. Button behavior is the same as the FPMx2 button controlled by skipby2. 182: Function CalcTimerConsts() (below) is called. 183: Processing delays 200 ms (variable fld), then loops back to line 107. 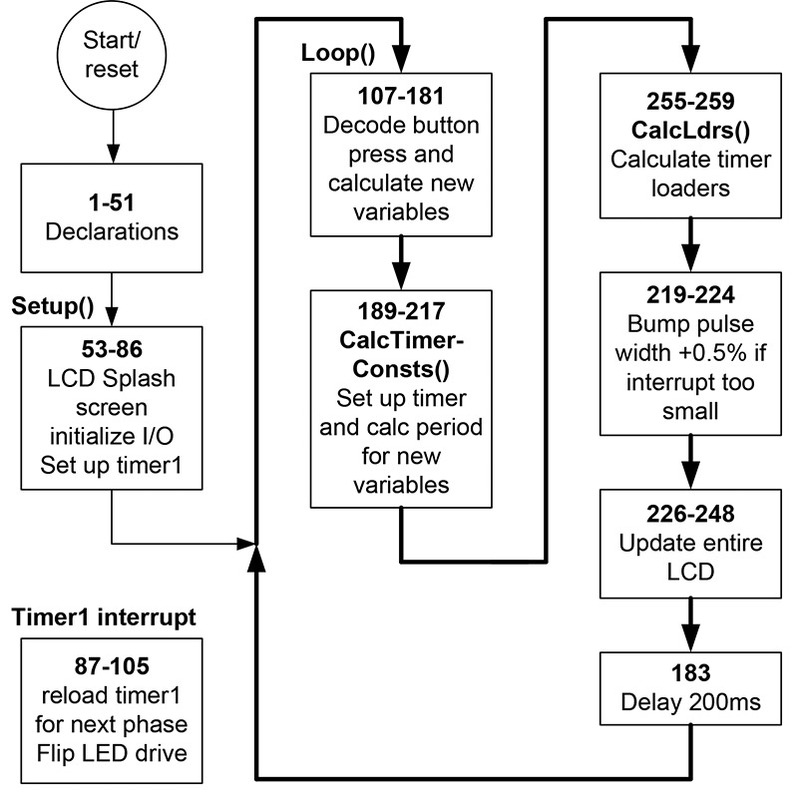 This section uses the inputted data of desired flashes per minute and desired pulse width to calculate Timer1 constants to be loaded on the next Timer1 interrupt. The code first tests the FPM register, sets the timer prescaler, and calculates the total interrupt loader for the entire period (on time plus off time). Refer again to Table 1. If FPM ≥ 14,649, prescaler = 0 and period = rXtal/FPM. If FPM ≥ 2,000, prescaler = 8 and period = rXtal/(8*FPM). If FPM ≥ 300, prescaler = 64 and period = rXtal/(64*FPM). If FPM ≥ 100, prescaler = 256 and period = rXtal/(256*FPM). If FPM < 100, prescaler = 1024 and period = rXtal/(1024*FPM). Then, call the function CalcLdrs (described shortly) to calculate the timer loaders. As referenced above, this piece of code tests the on time pulse width. If the timing is too fast for the interrupt process to function reliably, it automatically increases the pulse width (in 0.5% increments) until the calculated interrupt time is within limits. Using my Arduino Nano 3.0 and the Arduino IDE, the threshold for interrupt pulse width is 236 cycles, as shown in line 219. If your setup is different and flashes erratically, try increasing this number to compensate. It’s not a big deal — just increase the number in line 219 and recompile until it behaves. No magic here. The top LCD line shows the FPM, and the bottom line shows the pulse width percentage and the battery voltage. Additionally, if the code has automatically bumped the pulse width to overcome the short interrupt problem (see above, lines 219-224), splatOn will have been set. This routine places an asterisk next to the pulse width. The .999 factor shortens the off time by a very small amount in order to compensate for the occasional timer ticks lost during the interrupt process. Its value was determined experimentally. This section tests the output phase by looking at the output pin, then reloads Timer1 with the loader for the opposite phase and flips the phase of the output pin. My prototype can be easily duplicated or you can build the StroboDuino into a different enclosure using different LEDs, a different power source, different LCD display, or even a different Arduino. There is nothing at all critical about the assembly, and the sketch will work on other Arduinos. As mentioned previously, mine is built of clear plastic so the fit of all the components could be seen. Let your imagination go, or just build it into a baseball card box like I did. If you use the 12x2 display called out in the Parts List, the tiny 0.05” spacing on the connector is hard to solder manually. Using a PWB makes it a little easier, but not by much. If you decide to use a different display with the conventional 0.1” connector spacing, using standard perf boards at a much lower cost makes sense. Your call! The PWB artwork is also available in the downloads section. There are two adjustments to be made at final assembly time. First, R5 should be adjusted for the most pleasing display appearance to you. Then, the battery voltage must be calibrated. With a new set of batteries installed, set R3 so that the LCD displays “12V.” That’s it. You’ll be able to watch the effects of high pulse widths and decreasing battery voltage with age and use. At this point, there’s not a lot to add. However, the pulse width deserves a little discussion. The LEDs are bright enough so that they will normally overcome normal room illumination and be sufficiently bright even at the narrowest PW of 0.5%. If the brightness isn’t sufficient, you can increase the pulse width and get more illumination. However, as the PW increases, resolution decreases. The fastest PW (0.5%) means the LEDs are on for 0.5% of the time. When a rotating device is being visually stopped by the Stroboduino, a PW of 0.5% means that the LEDs are on for 360° x 0.5%, or 1.8° of arc. This presents a pretty sharp image. However, increasing the pulse width to, say, 5%, means the LEDs are on for about 18° of arc, causing a decidedly smeared appearance. You can decide how much PW you need, and how much smearing you can tolerate in the situations you encounter. The StroboDuino times with the flashes per minute rather than the SI unit of Hz. This is because — conventionally — motors are rated in RPM, and FPM and RPM correspond 1:1. The StroboDuino takes it a step further with its display and all its internal computations based on FPM. If you need to convert back to Hz, 1 Hz equals 60 RPM (or FPM), so conversion to Hz only involves dividing FPM by 60. A footnote to this is that if you choose to use a 16x2 LCD display, you’ll have space to put Hz on the display in addition to FPM [lcd.print(String(fpm/60, DEC));].